This hotel enjoys an idyllic setting on the edge of the city of Denpasar. 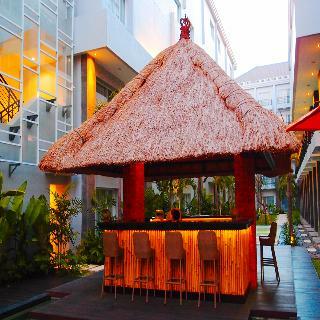 The hotel is located just a 10 minutes' driving distance away from the mesmerising Kuta Beach. The hotel is conveniently located just a 20 minutes' drive away from the airport. This wonderful hotel is set amidst 6,000 metres squared of grounds, enjoying a peaceful, serene ambience. The architectural design of the hotel blends natural and traditional influences and modern, minimalist style. The guest rooms are beautifully designed, featuring sleek designs and exuding classical elegance. This hotel prides itself on its homely ambience, exemplary service and dedication to customer satisfaction. This charming hotel is set in Denpasar. 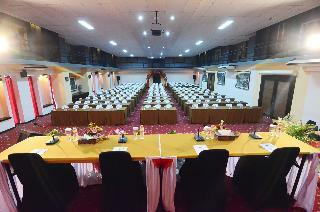 The property consists of 74 guests rooms. All kinds of guests will keep updated thanks to the Internet connection available at Hotel Grand Santhi. The reception is open 24/7. Cots are not available at Hotel Grand Santhi. Those who dislike animals may enjoy their stay, as this accommodation does not allow pets. 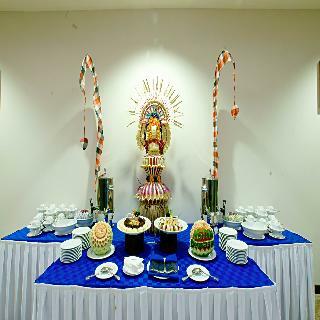 Some services of Hotel Grand Santhi may be payable. 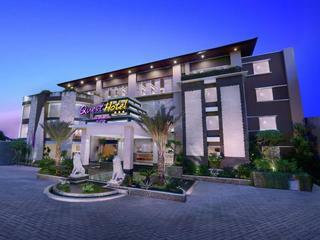 This city hotel is located in the heart of Denpasar. It offers easy access to all of the main attractions in South Bali and the surrounding areas. It is just an hour-drive from Denpasar International Airport and close to the island's main business areas and central government offices. This luxurious hotel welcomes guests into a lobby and offers a hotel safe and wireless Internet access. 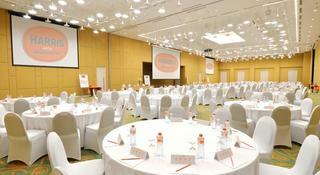 There is a restaurant on site, and guests will appreciate the conference facilities on offer. The apartment-style guest rooms are tastefully decorated and come perfectly-equipped. The spacious bathrooms feature a bath and a shower, they also come with a desk and individually regulated air conditioning. Guests can enjoy a swim in the outdoor swimming pool, followed by a relaxing massage or spa treatment. The hotel restaurant offers a varied menu and serves delicious and fresh meals on a daily basis. 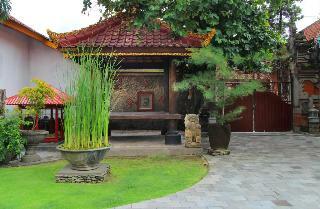 This property is located in Denpasar . The property consists of 147 rooms. The property is wheelchair-accessible. Guests may take advantage of the on-site car park. Check-out is at . Pets are allowed on the premises. Large pets are allowed on the premises.Set in the town center, this colorful budget hotel is 3.5 km from the Bali Museum, 6 km from Seminyak Beach and 12 km from Ngurah Rai International Airport.Offering free Wi-Fi, the simple rooms also have flat-screen TVs and air-conditioning.The hotel provides free breakfast and parking, plus a cafe area with vending machines. 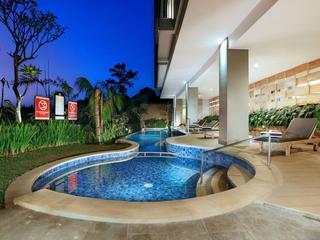 Located in the heart of Denpasar the capital city of Bali island. Close to the business and shopping district government office and banks. Only 45 minutes drive from Ngurah Rai International Airport and takes 10 minutes to Ubung the bus station. this comfort hotel consist of 24 rooms in total a swimming pool and a restaurant to serve daily breakfast. Located in Bali , this popular property offers an ideal place of rest and relaxation. The property consists of 173 rooms. Guests can enjoy the convenience of 24-hour reception. Guests can make use of internet access to stay connected to work or home. The property is wheelchair-accessible. Guests may take advantage of the on-site car park. Pets are allowed at this establishment. Large pets are allowed on the premises. 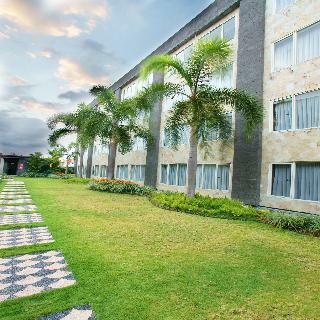 Quest San Denpasar is modern, convenient, and enjoyable international standard 3-star hotel with 179 delightfully furnished rooms and suites and a wide array of facilities including an eclectic restaurant, a swimming pool, a ballroom and several meeting rooms ideal for small to medium seized events. It is essential to always feel like home. When you are away, Alamanda Town House is the right place to stay, to relax and to share with love one. 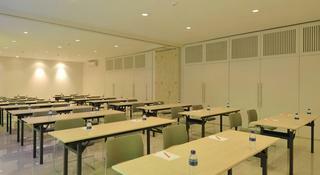 Nestled in the heart of Denpasar city is the prestigious advantage. Only few minutes drive to some most attractive places in Bali, as well as a center of business Bali.Consisting of 6 two-bedrooms apartments, Alamanda Town House set in the beauty of Balinese environment. Each of it, completely equipped with kitchen set, and living room. Either for short family holiday or business long term rental this town house is a perfect answer.